Chicken can be a low-fat, good source of protein, but when it's prepared in unhealthy ways, the fat content is increased due to fried coatings and creamy sauces. To retain the healthy nature of chicken, it's important that you cook it in a way that does not use extra fat. Steaming chicken is ideal when you're adding the chicken to other recipes, like salads and pasta. It cooks the chicken thoroughly without adding extra fat and allows the true taste of the chicken to shine through. Rinse defrosted or fresh chicken under cool water and pat the pieces dry with paper towels. Discard the paper towels. Cut the chicken into smaller pieces, if desired, which will speed the steaming process. In a medium-size pot, place a steamer basket to use as a guide to the amount of water to use in the pot. Put enough water into the pot until it is just below the steamer basket. Remove the basket. If desired, add savory herbs and lemon slices to the water, which will help create a fragrant steam and flavor the chicken. Bring the water to a boil using high heat on your stove. Lay the chicken pieces in a single layer in the bottom of the basket. Place the basket into the pot carefully and cover tightly for 8 to 10 minutes. Avoid opening the lid to check the chicken, as it will release the steam and prolong the cooking process, as well as lead to drier chicken. Remove the chicken once a meat thermometer inserted into the thickest piece reads at least 165 degrees Fahrenheit. Sprinkle the chicken breasts with fresh lemon juice and your favorite herbs -- rosemary and oregano pair well with lemon. The chicken will be unseasoned when finished, but adding creamy sauces can increase the fat content. Serve chicken with other low-fat, low-calorie foods to round out a healthy meal. Steamed vegetables are packed with color and flavor, not to mention essential vitamins. Then, add a healthy starch, like a baked sweet potato. Save the leftover chicken. Store it in an airtight container in your fridge for three to four days. You can add the chicken to salads, soups and use it on sandwiches and wraps in order to enjoy protein that has no added fat. Freeze cooked chicken to extend its shelf life to four to six months. 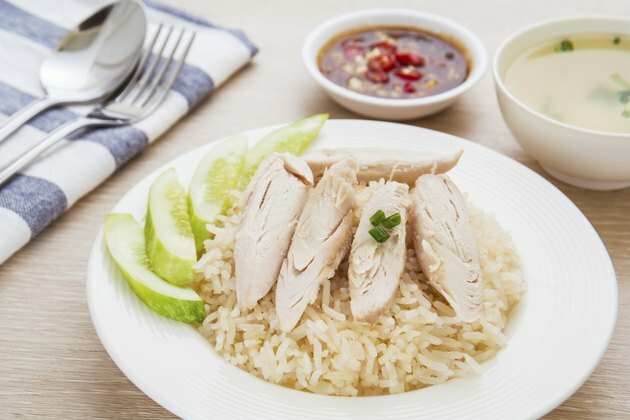 This way, you can purchase bulk quantities and steam large batches of chicken at once, then freeze the meat to use in recipes over the course of several months. Never cook fresh chicken that has a pungent, unpleasant smell or grayish color. It's likely been sitting in a fridge too long and is no longer safe to eat.